As the summer heat continues, we’re collecting donated fans for seniors in its Meals on Wheels for Greater Houston program. IM’s Meals on Wheels delivers meals to more than 4,000 home-bound seniors in Harris County. Excessive heat exposure is a risk for all during the summer months, but is especially threatening to those who are sick or elderly. 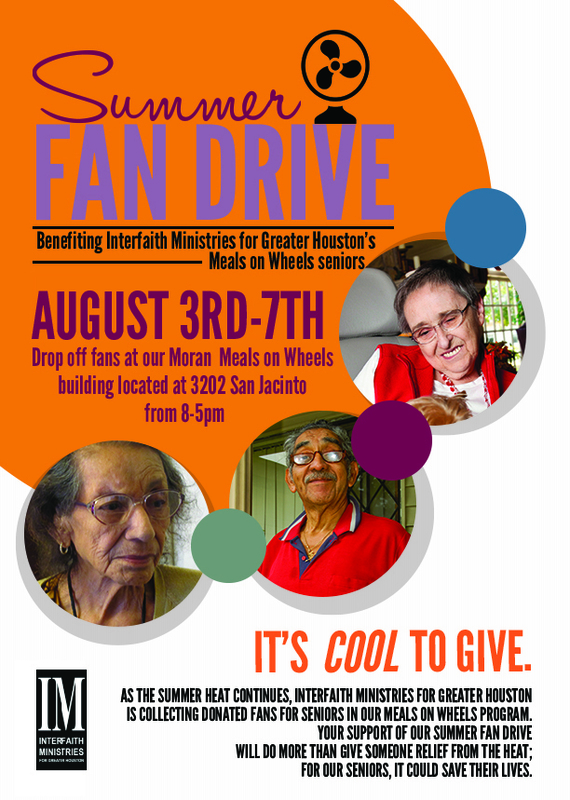 This week, August 3rd-August 7th, Houstonians can drop off fans at IM’s Moran building, located at 3202 San Jacinto St. Houston, TX 77002 between the hours of 8:30am-5pm. “Many of our frail seniors do not have working air conditioners. Older seniors suffer greatly during Houston’s hot summers and it can easily become a dangerous situation. Fan donations are greatly appreciated”, said Tabinda Ghani, Manager of Senior Services at IM’s Meals on Wheels. Your support of our fan drive will do more than give someone relief; for our seniors it can save their lives.